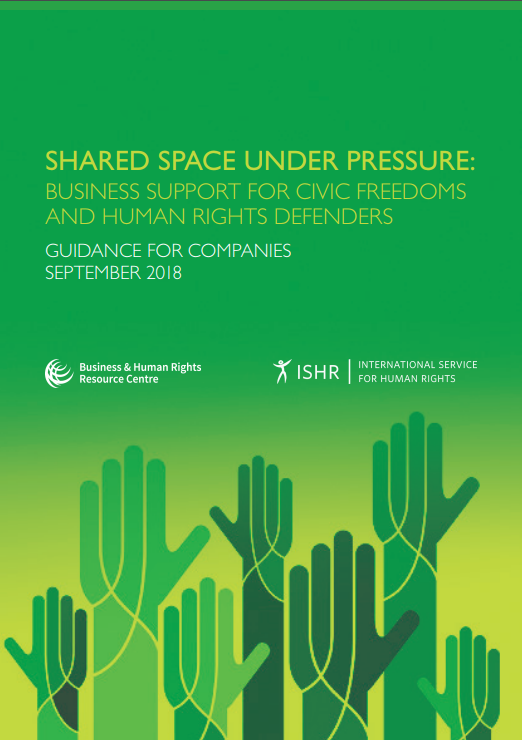 string(1310) "Resource Centre > Uncategorized > Shared Space Under Pressure: Business Support for Civic Freedoms and Human Rights Defenders – Guidance for Companies"
This guidance draws on over 90 interviews with company and industry associations representatives, responsible investors, civil society advocates, human rights defenders, as well as leaders of multi-stakeholder initiatives, academic experts, and government and UN officials. It encourages companies to focus on this increasingly inescapable agenda, and urges them to engage and to act—carefully but deliberately—in their own interests and in the mutual interest that they share with civil society. It sets forth both the normative responsibility, the business case and the moral choice that companies should consider in the face of these growing pressures, and proposes a decision framework to guide companies as they decide whether and if so how to act. This guidance also encourages civil society to work with business, when appropriate, and identifies multiple examples of actions and initiatives drawn from different sectors and regions. The document was mainly authored by Bennett Freeman, a longtime leader and innovator in the business and human rights field.